This is a photograph of Reuven and his two brothers, Avraham and Elisha. Reuven is on the left. He has Ewing’s Sarcoma. And it is at stage four. That means that it has metastasized, spreading to another organ. The lesion on his lung first seen in the MRI (done last Shabbos) was removed and analyzed yesterday. It was found to be of the same cancer type as the original lesion that was found on his left humerus bone. This was a devastating blow to all of us. You can’t imagine what it was like getting this news. But stage four Ewing’s is not necessarily lethal. Rueven has several things in his favor. First his age. Younger children have better event-free survival than older adolescents and young adults. Also the fact that his bone scan was clean and the bone marrow tests showed no evidence of disease is also a plus. And the fact that the metastasis was on the lung is a plus too. It has been observed in clinical studies that with intensive therapy, survival in patients with Ewing’s who have only pulmonary metastases is higher than for patients with bone or bone marrow metastases. We are cautiously optimistic. Barnes-Jewish Hospital in St Louis is one of the highest rated Hospitals in the country. And Reuven’s doctor is one of the top pediatric oncologists in that hospital. The multi agent chemotherapy begins early next week. It will be combined with an additional protocol that is currently under study. It involves heavy doses. It will be of one year duration and administered in a vaired manner every week requiring a hospital stay every fourth week. There will likely be side effects. His immune system will be weakened and he will be more prone to infection. It will be very hard for Reuven, but perhaps even harder for his father and mother. And his grandparents, aunts and uncles. But we are all determined to do what’s necessary to see this through and pray to HaShem Yisborach for a complete Refuah Shlaima for my grandson. I will be posting occasional updates here, when warranted. I want to thank the wonderful Jewish community in St. Louis, which has been most outstanding in their empathy and support, both in substance and emotionally. They are there for my family. Words fail me. It is truly inspiring. I want to also express my thanks to the Hospital staff. They too have handled the situation with the kindness and caring that I didn’t think existed anymore. 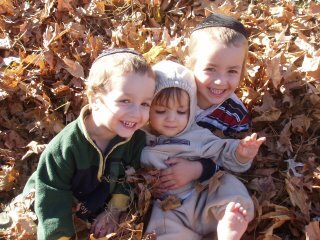 And I would like to express my family’s appreciation to all those who have sent comments and private e-mails wishing Reuven a Refuah Sheleima… have said Teffilos, …have made MiSheberachs… have helped put Rueven on numerous Tehillim lists …have given his name to rabbinic leaders here and in Israel… and even those who have simply kept him in your thoughts. Here, too, I am at a loss for words. The outpouring of sympathy and good wishes has been very heartwarming. And it has come from all segments of Jewry. I cannot thank you enough. Reuven needs a Siyata D’Shmaya more than ever now. Please keep him and my family in your hearts and in your prayers.